The CT Pour Tour is a fundraising effort to raise money for pediatric cancer research. It kicked off Saturday, January 11th at Two Roads Brewery. Todd Rugere of Grafton, Massachusetts started the tour in his home state last year. He drank a beer in all 351 Massachusetts towns and raised $43,000. He hopes to surpass that amount with the Connecticut tour. 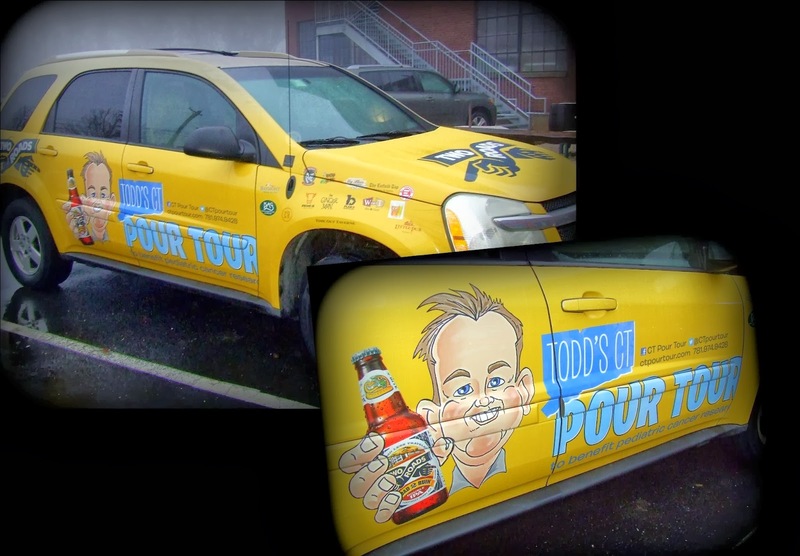 For this year’s tour Todd will be visiting breweries and brew pubs in all 169 Connecticut towns. In towns where there isn't an appropriate public location he is counting on the the generosity of regular folks to let him into their homes to raise a glass. He plans to complete the tour in about 9 months. He will be donating all the proceeds of the tour to Smilow Cancer Hospital at Yale-New Haven. I asked him why children’s cancer was the focus of his fund raising efforts. I expected him to say he had a child or sibling who had been devastated by the disease. Instead he said that the television commercials depicting children suffering the effects of cancer affected him so strongly he felt he had to do something to help. Two Roads generously provided the venue for the kick off event. They didn't stop there. Two Roads also offered the services of their own design team. Todd worked with Jordan of BRZoom to design a shrink wrap Todd's 2005 Chevy Equinox. Two Roads paid for the actual shrink wrapping of Todd's car. They are also contributing the art work for promotional materials which Todd will use to create flyers, poster, etc. to advertise his visits. In addition to helping with other expenses, Two Roads is donating $1 dollar for every beer sold the day of the kick off event. The brewery was not alone in supporting the kick off of the Pour Tour. The bartenders generously donated 10% of their tips for the day. And Betty Mathis, a Stratford resident, gave the first donation; a check for $100. Betty doesn't drink but believes in his cause and wanted to contribute something to the effort. I, myself, contributed by drinking several pints of the Anniversary Ale. It was a sacrifice but I was willing to suffer through it. Two Roads did so much better than that. $1078 was the total raised at the brewery. That includes $145 contributed by the bartenders from their tips. 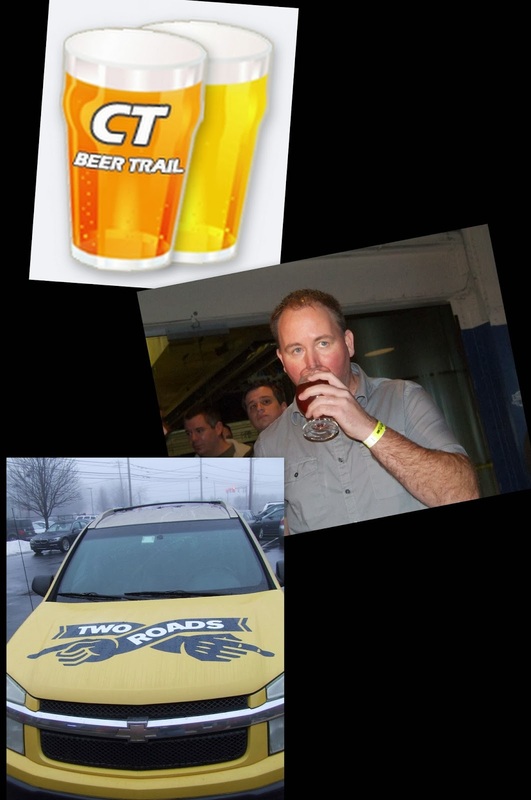 The CT Pour Tour continues January 18, 2014 with CT Beer Trail hosting a special excursion to help move Todd along and meet his goals. The tickets cost $116 and must be purchased beforehand. Todd doesn't have the entire trip mapped out. Drop him an email if you have a suggestion on locations he should keep in mind or if you would like to make a financial contribution. Follow Todd's adventures on Facebook and Twitter.